I created a fun and easy beading tutorial for advanced weavers and determined beginners. 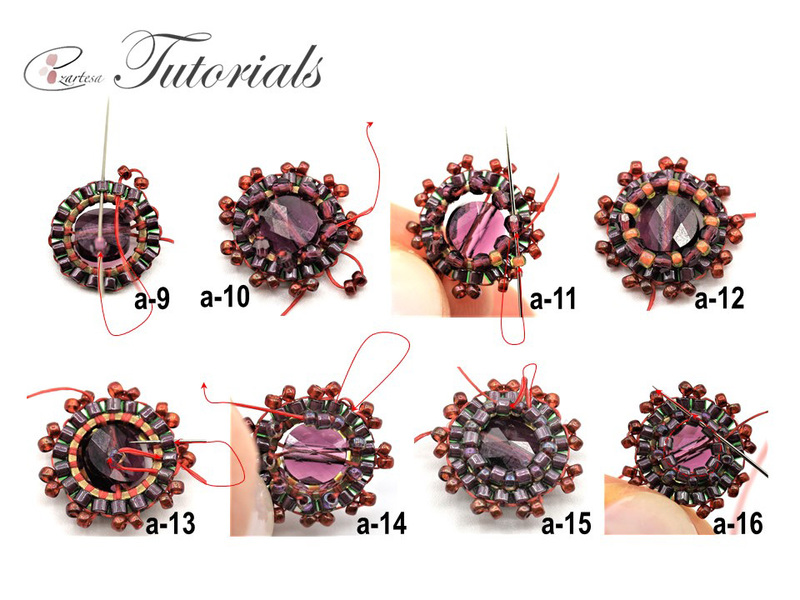 Learn how to incorporate in your beadwork Swarovski crystal rose montees, mini rounds and open round rings. Materials for a pair of earrings. In this beading tutorial I’m using size D Nylon thread in reed color (conditioned with beeswax). Bead, Swarovski® crystals, Crystal Passions® amethyst, 6mm faceted mini round (5052), 2 beads. Bead, Swarovski® crystals, Crystals, amethyst, 2mm faceted round with 0.6mm hole, 18 beads. Component, antique brass-plated brass, 9mm open round with 7mm hole, 2beads. Swarovski crystals and silver-plated pewter, scarlet, 3-3.2mm rose montees with 0.4-0.6mm hole, 2 beads. approx. 0,5g size 11o A – opaque color-lined green/maroon. approx. 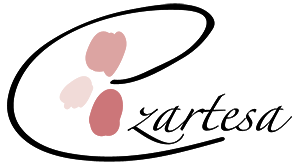 0,5g size 15o B – transparent color-lined fancy rose gold. approx. 0.5g size 15o C – Transparent color-lined rainbow purple. approx. 0.5g size 15o D – Translucent gold luster cranberry. approx. 0.5g size 15o E – 24Kt gold plated. Ear wire 13.5mm fishhook with open loop. pick up 9mm open round and sew the needle through the ring and exit up through the same end of 11o B bead (photo a-1). 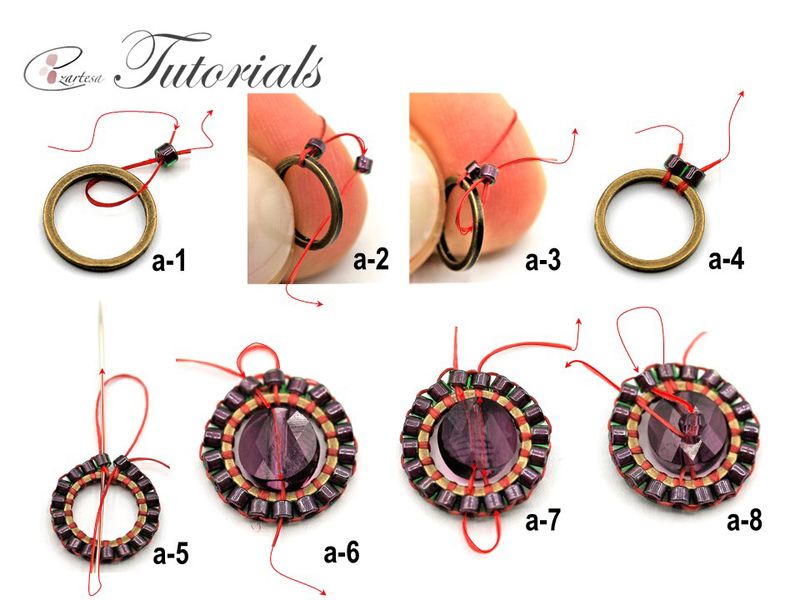 Work around till you have a total of eighteen 11o A color seed beads around the ring (photo a-2, 3, 4, 5). Connect two last beads by sewing the needle down through the next 11o A bead (photo a-5) and come up through the bead where you started. Sew the needle down through the next 11o A and string 6mm mini round (photo a-6) sew down through the opposite 11o A bead (at the other end of the ring), turn the beadwork up side down, sew the needle to the left through the next 11o A bead, go through the 6mm mini round bead and exit through the opposite 11o A bead (at the other end of the ring) (photo a-7). Sew the needle down to the left through the one 11o A bead, pick up one 2mm amethyst Swarovski round bead and sew up through the next 11o A bead (photo a-8), then string two 15o D beads and sew down through the next 11o A bead (photo a-9). Work around the ring till you have a total of nine 2mm beads and nine 15o D pairs (photo a-10). Then exiting one 2mm amethyst bead string one 15o B bead and sew through the next 2mm bead (photo a-11). Work around the ring till you have a total of nine 15oB beads (photo a-12). Secure the thread at the other end of the beadwork, sew the needle down through the 11o A bead, string one 15o C bead and come up through the next 11o A (photo a-13). Repeat around the ring. Then exiting last 15o C string one 11o A bead, sew through the next 15o C and work around the ring till you have a total of nine beads (photo a-14,15) and sew the needle through the all nine beads two times (photo a-16). Secure the thread at the other end of beadwork and exit 11o A and 15o D at the top of earring (photo a-17), string two 15o Bs and sew down through the next 15o D, come up to the right through the 15o D and 15o B beads. Work three more 15o B pairs (photo a-18, 19). Secure the thread at the other end of beadwork and exiting 15o D bead (photo a-20,21) work one 15o E bead between the pairs, and then two 15o B s…repeat around the ring. Then secure the thread in the beadwork and trim. Secure the thread that exits 15o B bead and string two 15o Es, ear-wire, two 15o Es sew down through the 15o B and come up through the next 15o B and 15o D beads (photo a-22). Then sew the needle up through the 15o E, ear-wire, down through the two 15o Es and 15o B bead, string 15o B, 15o E, 15o B skip one bead and sew the needle through the 15o B (photo a-23), come up through the next 15o B, and repeat to the other side (FIGURE 1). Weave the thread up through the two 15o Es, ear-wire, two 15o Es, one 15o B and string the Swarovski rose montee, skip two beads, and sew diagonally through the one 15o B, come up through the next 15oB, sew diagonally through the Swarovski montee and exit through the opposite 15o E bead (photo a-24, 25) (FIGURE 1). Secure the thread in the beadwork and trim. Repeat to make a second earring. To sea more beading tutorials and patterns go to my beading tutorials page. All text and photos copyright by jewelry designer Ezartesa.